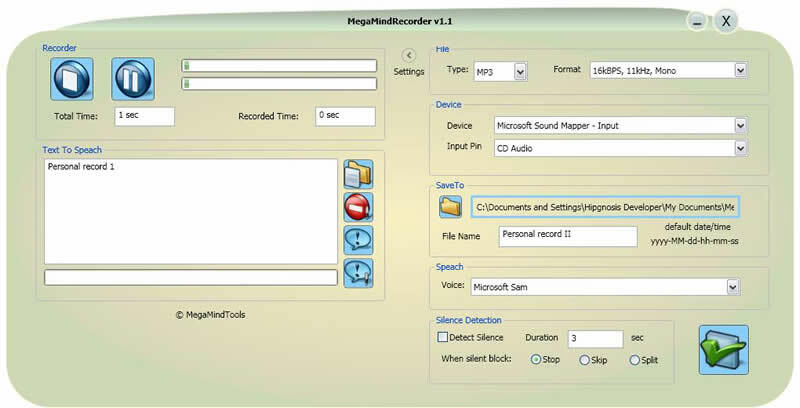 MegaMind Recorder is an extremely intelligent audio tool, for easy recording regardless of the sound source (e.g. audio CDs, TV, audio tapes, DVDs, online radio, live performances, video games etc). The audio files can be saved on your computer using various formats: MP3, WMA, OGG, VOX, AU, AIFF. The app also comes with text-to-speech conversion features for your documents based on natural-voice-reading. ...... an audio file and save it as MP3, WMA, OGG, VOX, AU, AIFF etc. MegaMind Recorder focuses on ease of use which concerns both recording features and features available in the text-to-speech function. The latter uses natural voices which makes more enjoyable listening to what were initially text documents. Qweas is providing links to MegaMind Recorder 1.3.0 as a courtesy, and makes no representations regarding MegaMind Recorder or any other applications or any information related thereto. Any questions, complaints or claims regarding this application MegaMind Recorder 1.3.0 must be directed to the appropriate software vendor. You may click the publisher link of MegaMind Recorder on the top of this page to get more details about the vendor.